Local non-profit energy provider Robin Hood Energy launches campaign to champion kindness across Nottingham. Ahead of Nottingham Kindness Day (27th July 2018), Robin Hood Energy will be championing the kindness of Nottingham people. Have you witnessed something in the street that was driven purely by someone wanting to do good? Did you see someone helping a stranger, or maybe a stranger helped you? Has someone you know completed something selfless that needs to be shared? 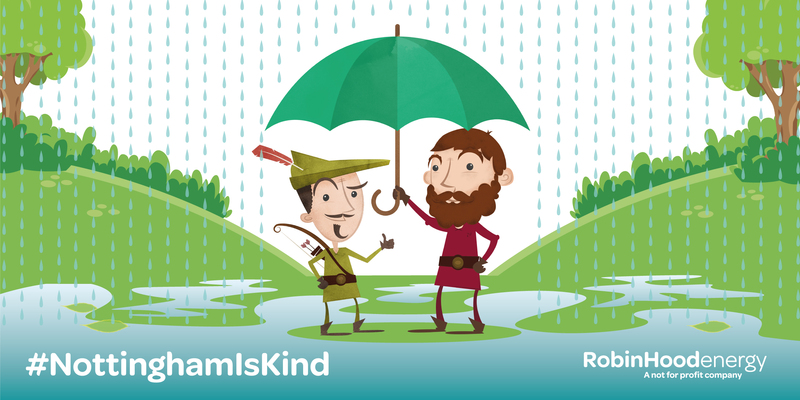 You can share all your stories of kindness with Robin Hood Energy on social media using the hashtag #NottinghamIsKind, and they’ll let us all know the winner on Nottingham Kindness Day on July 27th – and they’ll be crowned Nottingham’s kindest person. The entire ethos of Robin Hood Energy is influenced by the principles of giving, championing helping other people and supporting the local Nottingham community. Previous Aldi in Stapleford, The Never Ending Story!